Poetry and still photography appear to be incompatible aesthetic media. Both expect the viewer / reader to enact them by participation, but in different ways. Poetry is temporal, with a clearly defined beginning and ending, requiring sequential reading, while a photograph offers a single image that does not oblige the viewer to enact a particular sequence of experiential positions. However, these media, under comparable aesthetic, cultural and social pressures, may share tactics that although expressed in different materials convey comparable sensuous, emotional, and imaginative experiences. The aleatory effect has become one of the characteristics of modern and postmodern art and literature. Introduced into photography by plein air photography (beginning with an 1838 Daguerreotype of a Parisian street scene), codified through the Romantic conception of the imagination, the role of chance in art has gradually become more central than peripheral. Two examples of the movement of contingency from secondary aleatory effect to structural principle are the recent works of John Ashbery and Robert Frank. For the purposes of this essay, “contingency” is the element of chance, while “aleatory” refers to the way the artist or writer uses chance elements within a given work. Although this essay argues that the use of aleatory effects to structure or largely compose a poem or photograph is relatively new, chance has a long history in art and literature. Contingent elements appeared in photographs from the invention of the medium, and their presence sparked critical discussion almost immediately. Aleatory effects entered poetry in new ways through Dada, surrealism, and other modernist movements. Some writers and photographers have characterized this as a revolt against static perfection and an embrace of an aesthetic of process and movement. But others have resisted or attempted to eliminate chance from their work, and the viewing or reading public world has not always found contingency easy to assimilate. Francis Frith, William Henry Jackson, and Edward Weston braced their large-format view cameras on sturdy tripods, and composed pictures almost the way a painter does with a canvas on an easel. Framing the subject with concentrated deliberation, these photographers had little use for contingent pictorial elements or deliberate aleatory effects. The expense and trouble of exposing large sheet film precluded casual risk-taking. But chance could not be entirely eliminated except in the studio, and once the 35mm revolution began, aleatory effects would become more and more an important part of photography’s aesthetic, even among photographers still using larger formats. For poets, contingency is first and primarily a function of the imagination mentally processing the chance elements of physical perception. Shaping those elements into aleatory effects requires some degree of linguistic cunning. Metaphor is an aleatory effect dependent on the contingent elements rattling around in the poet’s imagination. Poets have most often tried to minimize the aleatory effect of metaphor and have preferred to make the metaphor seem organic, natural, or otherwise inevitable. In the twentieth century, the Dadaists and others broke away from this effort to keep their tropes under control, and instead embraced a more reckless rhetorical array. More recent poetry has wielded aleatory effects without any attempt to shape them into orderly metaphors, and Ashbery, in particular, has excelled at writing poems in which contingency seems to have run productively amok. Photography, unlike poetry, is not entirely an imaginative venture. It is machine art guided more or less by human vision. The camera is a complex machine, even more complex in the digital age. As Lincoln Kirstein puts it, “Brush, paint, and palette can scarcely be considered a machine—the camera can never have been thought of as anything else” (191). The camera subjugates (but also complements) human vision with a seeing that is starkly material, with no intervening (that is, within the camera) intelligence. It fixes in a moment what in our eyesight is constantly shifting, flickering, changing. Its reproductive powers seem miraculous. As Walter Benjamin puts it, “For the first time, photography freed the hand from the most important artistic tasks in the process of pictorial reproduction—tasks that now devolved upon the eye alone” (20). Of course the eye can exert great aesthetic discretion. The photographer is free to choose, frame, and ultimately to push the button that affixes the camera’s (and the eye’s) vision. The combined act of perception and choice is frequently called “photographic seeing” (Sontag On Photography 136). The photographer is then free to manipulate the image in darkroom or computer, free to display or withhold the resultant image. The synergy between artist and her / his tools is complex but easily discernable. Here R.G. Collingwood’s distinction between art and craft becomes essential. Anyone can push a shutter button and compel the camera to produce a competent, properly focused photograph, either on film or digitally. The essential element of art, however, is elusive, and cannot arise solely from a craft that is largely mechanical. Some of the most compelling photographs display relatively low levels of craft. They may be compelling for this very lack of polish. Most of Robert Frank’s photographs display an apparent indifference to craft, even to careful composition. However, as Collingwood demonstrates, craft is emphatically not art, and confusing the two is odious. He defines “The aesthetic experience, or artistic activity” as “the experience of expressing one’s emotion; and that which expresses them is the total imaginative activity called indifferently language or art. This is art proper” (275). Most of the technical activity involved in photography is done by the camera, or by the darkroom process. How does “imaginative activity” come into it? Through the vision of the photographer, of course, which selects, frames, and mentally processes that vision until it yields a photograph. Except for its misleadingly mechanical aspect, photography is not too different, in its imaginative procedure, from the other arts. That many photographers expend more effort on technological perfection than on imaginative engagement suggests that photography is more often practiced as craft than as art. But then so is writing. But the metaphor as well as the actuality of the machine long ago invaded aesthetic thought. In Benjamin’s era of mechanical reproduction are poems machines made of words, as William Carlos Williams says? Such a machine would be a system, not a single object but a multitude in which every element functions. A continuous production line, as deconstruction reminds us. Not just the poem but language itself is a machine made of words, or rather a series of self- defining, contingent machines. A production line. Language is not just a vocabulary plus a set of rules, or grammar. It is an act of using words in which, ideally, every word functions in a way that furthers the overall purpose of the language-machine. Discourse—language in action—rarely functions at the ideal level. The machine coughs up extra, unnecessary parts, or staggers along without necessary ones. Poetry often forces discourse to do without elements that in other usages would be essential. Less commonly, it adds extra parts and forces them to work in strange and perhaps unsystematic ways. More recently, more emphatically, it is concerned with “bringing things together elliptically, according to the imperious but often arbitrary demands of subjectivity” (Sontag On Photography 96). In the Romantic-Modernist-Postmodernist formulation one important purpose of art is to tease the imagination to life and then to educate it. This may be why art can seem simultaneously social and antisocial. It unites viewers, readers, or auditors in an act of perception, then dissociates each of them into the lonely realms of the individual imagination (Frederick Schiller in On the Aesthetic Education of Man codifies this argument). The means of art are pictorial, dramatic, sonic, tactile, and even olfactory. Most forms of art appeal to more than one kind of sense-perception. Poetry is pictorial, dramatic, and sonic. Photography is pictorial, dramatic, and tactile. Of course the physical medium matters, but even more important is the means by which the sense-perception is engaged. Photography is pictorial because it is a picture. Poetry, although perhaps a step removed from direct representation, is not only aural but pictorial because it generates images, which the reader composes internally, imaginatively, rather than through receiving visual stimuli. Perhaps poetry has the advantage over photography in that its images are unmediated by the optic nerves and occur immediately in the imagination. Or perhaps photography has the advantage in relying on stable visual constructions that although always subject to individual processing provide an external anchor for the imagination (see Thompson 19). But certainly there is a parallel in the aesthetic of the still photograph and the lyric, image-structured poem. Although a poem may (and probably must) enclose or at least imply a narrative, the presence of the image, as the defining gesture, pushes the poem toward a photographic fixity. As Robert Rowland Smith observes, “because it can without jeopardy reject narrative time, the poem harps toward fixity, and most typically towards the fixity of the image—as if the poem were more photograph than movie” (6). The psychology of the imagination has not been properly studied, but clearly it is not a predetermined, immutable process but rather one open to education through stimuli of many kinds. The ongoing education of the imagination is the real purpose of civilization, and poetry is the most important element in this education, although it would difficult to prove that by examining contemporary American or European culture. Then there’s the problem of realism, which photography cannot escape without intense manipulation, and to which poetry owes no particular allegiance other than the necessity of using referential signs (words). Yet neither photography nor poetry enacts reality: both deal in images of reality rather than reality itself—one a verbal image, the other a visual image, each removed one step from reality. The relationship between image and reality is complex and changing. Its social and psychological dimensions shift, and the photograph occupies a complex role in modern society. But we mustn’t confuse the sign with that which it represents, even when the sign itself has considerable material reality. Narrative also may alter that image / reality relationship but doesn’t change it in any basic way. Susan Stewart argues that the realistic novel gives the reader the status of a character, “a figure who looks for signs or clues…. a reader of signs for their own sake, a reader of correspondences between the signs of the world, the immediate environment of everyday life, and the signs of the novel” (Stewart, On Longing, 4). Similarly, photography, the characteristic art of the nineteenth-century turn to realism, renders the viewer an inhabitant of the pictured world looking for signs. Jerry Thompson describes “The dialectic-like relationship between photographer and subject world” (24). The analogy between that characterization and the dialectics that empower poetry—that between the imagination and actuality, or between the poet-speaker and his or her antithetical self (as described, for instance, in Harold Bloom’s Yeats), is irresistible. Stewart goes on to describe, “The movement from realism to modernism and postmodernism” as “a movement from the sign as material to the signifying process itself” (5). The effect of this reflexivity in language is to call attention to “the world-making capacity of language, a capacity which points to the arbitrariness of the sign at the same time that it points to the world as a transient creation of language.” This is not about adding new knowledge to the world but of alerting the consciousness to a characteristic that has always been at the center of literature and the visual arts: the separateness of the world that art creates, the arbitrary nature of the sign—whether visual, sonic, or phonetic--, and the cultural fact that we live in worlds we conceive rather than simply discover. The Waste Land and The Cantos, as well as the work of Joyce, Stein, Williams, and others, made available to the English language a more freely associative and aleatory poetics. Since then the sequence, with its strong sense of the arbitrary, has replaced the narrative poem as a characteristic form, and the juxtaposition of images otherwise unassociated has become a compelling motif. But even in the individual lyric or meditative poem this liberated poetics has made possible a more inward poem, one that can more freely claim the imagination as a viable space in which to process the knowable world. At least since Henry James and possibly Milton one task of literature has been to capture the movement of thought (unspoken thought) and meld it with a satisfactory aesthetic (sound pattern, rhythm, visual imagery). Ashbery’s aleatory juxtapositions attempt to accomplish this without compromising unnecessarily with ordinary rhetorical expectations. However, they do much more than that: they generate feelings or even emotions that do not exist outside of his poems except in the experience of his readers. No child sat on the clay. Some, however, embrace a more surreal mode, which opens into more arbitrary effects. “Grand Abacus” posits as its subject “the head of long–ago” (32). This absurdity invites more aleatory responses, and the poem provides some. Sentience enters a stick, which tries to hide. The head stops pretending to be a town, although we hadn’t known that it ever had. Ashbery is moving toward contingency as a narrative principle, but this poem still retains some recognizable dramatic elements to hold it together. Improbable elements, certainly: “It is best to travel like a comet, though one does not see them.” The “head of long-ago” is not a conventional subject but it functions as one. It centers the poem, serving as the key structural element. While some of the effects in the poem may seem arbitrary, the overall movement of the poem is narrative and controlled by the presence of the key image. Ashbery’s early work illustrates Dahlberg and Olson’s description of the associative process in poetry: “one perception must immediately and directly lead to a further perception” (149). This process, which describes Wallace Stevens’ poetics as well as Ashbery’s early work, postulates perception as an aesthetic center, and so excludes chance as an organizing or structural principle. But to achieve his fullest aesthetic vision Ashbery would have to transcend perception and avoid replacing it with yet another self-confining principle. This is possibly analogous to the problem abstract expressionists faced in removing all traces of representation from their work. Seemingly chance elements occur in Ashbery’s earliest poems, but only when those elements supplant conventional organizing devices, including dominant images, complexes of related images, unifying sound effects, or narrative or dramatic motifs, does Ashbery mature into the poet of Self-Portrait in a Convex Mirror (1975). Helen Vendler describes the poetics of that key collection: “In Ashbery’s lines, words are often sprung free of their usual contexts: words that began in vertical relation to each other (as archaic words “stand above” contemporary ones, or formal words “above” slang), or in no relation at all to each other (such as the words “tacked-up” and “angst” are brought into horizontal (metonymical) intimacy with each other, in a slightly surreal, but comprehensible, narration” (58). Yet Ashbery would further fragment narration, eventually rendering its elements so aleatory as to do away with any pretense of conventional structure. He would call this “the polyphonic style,” and in a 1968 review attribute it to Ted Berrigan: “The polyphonic style…results from breaking up the traditional structure of poems. We are no longer listening to the poet’s voice, but to many voices, in harmony or totally out of touch with one another, relying garbled or clear or conflicting messages” (Review 117). and as such may be over, this time. Pass the Durkee's. And repent. and the president is eight months old. expression unto these untimely limbs. in building up to some calm, inconceivable commentary. The function of these various forms of contingency and juxtaposition is to broaden and deepen the poem’s range of association and reference. But Ashbery also keeps the reader centered on the emotional thrust of the poem, which generates a feeling that probably doesn’t exist outside of this linguistic construction. How is that possible? How does one describe the feeling generated by a phrase like “it shall be done unto you /as the maze requests.”? A political shudder? An atavistic fear of complexities? A slight note of reassurance? Like a fine wine this poem contains a complexity of effects that cannot be readily delineated but which add up to a definite experience that could not be attained through other means. Structurally it refuses narrative. Robert Rowland Smith argues that the refusal or of or resistance to narrative links poetry with photography: “Because it can without jeopardy reject narrative time, the poem harps toward fixity, and most typically toward the fixity of the image—as if the poem where more photograph than movie” (6). In this instance, not one photograph by a series of them, a scattering of miscellaneous snapshots. Among other things, poetry is a negotiation between public and private uses of languages. By this I mean the personal recasting of common vocabulary into associations that are highly individual and not necessarily intelligible to others. It may involve dislocated or garbled syntax, odd grammar, and connotative warping of familiar words into unusual relationships, either along the axis of selection or the axis of combination. A person who lacks a privately negotiated language with which to confront our public language is not a poet. The more powerful the private usage the richer but also the more difficult the poetry. Shakespeare is very complex, and much of his language is oblique and slanted away from his audience’s common vocabulary and syntax. Yet we aren’t offended; we’re used to Shakespeare, convinced of his greatness, and skim over his difficulties, unless we have a scholar’s investment in them. One day we will become used to Ashbery, and our emotional range having been so broadened, we will be able to describe more precisely the feeling engendered by an opening line like “We are all patting sleeping shoes.” If, as Linda Hutcheon argues, postmodernism involves rethinking history as a human construct, so for Ashbery it involves rethinking emotion as a human construct—which it obviously is, although it seems odd to say so (16). tions apply. Not to go all agony aunt on you. potato orchard with attached oriental kitchen. Whether Ashbery can go still further in rendering contingency almost the sole basis of structure (apart from sentence structure) remains to be seen. Some contemporary poets have even abandoned the sentence, but their work offers so little for the reader to cling to that discussing it is difficult. The photographic equivalent would be a sheet of printing paper with only random exposed silver grains and no discernible image. The use or validity of such work lies beyond the scope of this essay. As with poetry, a good photographer wields an individual vision to overlay on the common objects and scenes of the world, and the postmodern photographer uses photography to rethink modes of perception. Photography works by framing, selection, and affixing angles of vision that in the actual world are infinitely variable. Photography can generate analogous effects through choices in subject matter, framing, and composition. Manipulating the photograph after initial exposure can create, heighten, and amplify these effects. At least for some of its practitioners, photography is the one art that allows aleatory or contingent—that is, unmediated, dependent on chance--elements to enter it. This seems to distinguish photography once and for all from painting, as well as the other visual arts. Photographs taken opportunistically outside of the studio usually contain aleatory elements, except in the case of extreme close-ups that exclude all but the main subject. A photograph taken on the street, regardless of how carefully the photographer frames or angles it, can’t and shouldn’t exclude chance or accidental imagery. Susan Sontag argues that “The contingency of photography confirms that everything is perishable; the arbitrariness of photographic evidence indicates that reality is fundamentally unclassifiable” (On Photography 80). But when Sontag wrote this in the mid-1970s she hadn’t seen much of the work that would extend contingency into a basic structural principle. Since Lee Friedlander and Garry Winogrand burst onto the scene in the 1970s, many photographers have made contingency a central aesthetic gesture. Friedlander, Winogrand, and William Eggleston working in color, in the 1960s and 1970s pioneered modes of clutter and contingency as subjects; but earlier, Frank, in The Americans, illustrated how potent certain aleatory effects could be. Like Ashbery, Frank even in this relatively early work juxtaposes and / or melds objects to blur the lines between them, and between them and us. Frank has been criticized for neglecting the technical aspects of photography, but as Collingwood argues, craft and art and different things. In the growth of 35 mm photography in the 1940s the work and teaching of Sid Grossman and Alexey Brodovitch challenge the impeccable craftsmanship Frank and other magazine photographers had already mastered, and sparked the rise of what Peter Galassi refers to as the “quality-be-damned” school (15). Brodovitch was Frank’s mentor at Harper’s Bazaar. Brodovitch’s 1945 collection of photos of the Ballets Russes suggested that apparent imperfection (by the established standards of then-current magazine photography) could more fully focus the sense of immediacy and presence that are photography’s peculiar strengths. Janet Malcolm in 1978 noted that “Robert Frank…scrupulously shed all the pictorial values of his predecessors—composition, design, tonal balance, print quality—and produced pictures that look as if a kid had taken them while eating a popsicle and then had had them developed and printed at the drugstore” (114). Malcolm would later re-evaluate Frank’s work in more approving terms, but meanwhile Frank would have gone much further in distancing himself from pictorialism and other familiar modes of still photography. The relative ease with which anyone can master the technical aspects of photography falsely suggest an easily attained artistry. In this way, photography as an art form has always been bedeviled by its own technology. Although the perfection of the mechanical reproduction of an image was, arguably, achieved immediately by the daguerreotype, and has never been superseded, many photographers of unquestionable artistic integrity have devoted too much of their time and energy chasing the perfect museum-quality print. Perfecting that technical aspect of the work has too often distracted from photography’s engagement with the imagination, the only thing that can make it art. Frank does not let technological idealism stand in his way. If anything, he exploits blur, grain, and improper exposure to lend dramatic depth to his compositions. As Susan Sontag notes, “In recent decades, photography has succeeded in somewhat revising, for everybody, the definition of what is beautiful and ugly—along the lines that Whitman has proposed. If (in Whitman’s words) ‘each precise object or condition or combination of things exhibits a beauty,’ it becomes superficial to single out some things as beautiful and others as not” (On Photography 128). But beauty is a formal consideration as well as a choice of subject, and by abandoning or ignoring the established technical conventions of photography Frank implicitly rejects the standards of photographic excellence (and beauty) projected by Ansel Adams, Edward Weston, Imogene Cunningham, Alfred Stieglitz, and many other eminent predecessors. Frank was not the first to see that photography would move far away from pictorialism and other fine-arts models (including the Photo-Secessionists and the f.64 group) that had impeded its development into a more open and aleatory mode of seeing. In 1931 Walker Evans wrote presciently, “Suddenly there is a difference between a quaint evocation of the past and an open window looking straight down a stack of decades. The element of time entering into photography provides a departure for as much speculation as an observer cares to make. Actual experiments in time, actual experiments in space exactly suit a post war state of mind. The camera doing both, as well as reflecting swift chance, disarray, wonder, and experiment, it is not surprising that photography has come to a valid flowering the third period of its history” (126). The small camera era, begun even before the 35mm Leica appeared in 1924, changed not only the means but the available aesthetic stances available to the photographer. Evans and Henri Cartier-Bresson demonstrated beyond all possible argument that the smaller format offered opportunities unavailable to the clumsier larger format cameras, but also challenged the fine arts subject matter, large and perfect prints, sharp focus, and other received aesthetic values formulated in the first hundred years of photography’s history. For The Americans, however, Frank selected photographs that even in challenging established standards still present discernible formal strategies. In Bar, New York City three planes of depth register. The first, on the right, consists of a slightly out-of-focus arm angling through the foreground. Centered in the second plane is a jukebox, also slightly out of focus. It is a mass of white light and complex detail, and in its angry illumination looks almost alive with power and rage. Behind it, on the left side of the photo, a couple sits in a booth with two glasses on the table. The man also looks a little angry, as if about to rise and confront the jukebox, or the owner of the arm in the foreground. The jukebox occupies the center of the photograph and could be construed as its subject, but the human context framing it qualifies its modernist distinction. The couple in the background, whose presence is merely contingent, bring the photo to life by posing a human dynamic against a machine dynamic, one that ironically embodies a sophisticated mode of culture of culture abased into a modish but mundane commercialism. The couple in their bland Fifties clothing look almost timeless, but the jukebox, surely Allen Ginsberg’s “hydrogen jukebox,” sneers with a brilliance with which no mortal can compete. The presence of the couple, because contingent, unopposed, and perhaps for many viewers only an incidental detail, still performs a familiar pictorial function, one that easily submits to this sort of analysis. 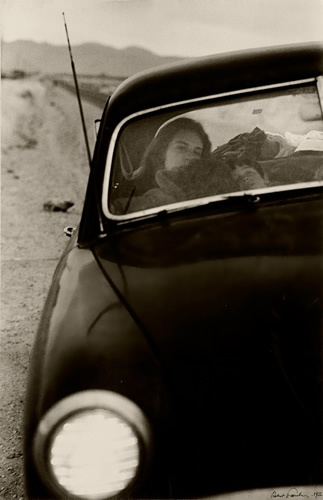 Robert Frank’s early photographs, from Britain and Wales through The Americans, display a fascination with the other. The Americans, as well as his earlier work in London, portrays the eccentricity, conformity, and sometimes loneliness of other people in their chosen environments. But eventually Frank turns inward, to the self and the domestic world, as the title Lines of My Hand suggests. His formal means change as well. By the time Frank has worked through the experiences of cinema, especially in the making of Pull My Daisy (1959), his notion of the still photograph becomes radically decentered. Shooting, directing, and editing the additional on-location 16mm films Frank produced in the early 1960s opened him to fresh possibilities both in composition and in content. Cinema devours aleatory effects at such a rate that the viewer may not focus on or even notice them. But in shooting and editing these films Frank would have been alert to how certain angles—shooting from above groups of figures, for instance—would reorder the contingent details in the frame and either emphasize or deemphasize as the framing emphasized or deemphasized the ostensible center of interest. Frank had always been innovative in his framing, angles, and selective use of focus. But in The Americans those innovations usually serve to shift the view of the primary subject without decentering it. The publication of The Americans now seems a decisive step in moving photography from a fine arts model to a literary model. The careful arrangement of the book reinforces the impact of each image, and constitutes an unconventional but definite narrative. Although other photographers had published coherent collections of images, Frank’s book most aggressively pushed the notion that rather than relying on external narrative ideas (exploration of exotic places, unfolding human dramas) the aesthetic form and content of the individual photographs could link themselves into a coherent whole. Other photographers have followed this lead: Winogrand’s Women are Beautiful, Friedlander’s The American Monument, and Eggleston’s Guide are well-known examples. These all, including Frank’s work, derive from Evans’s American Photographs, but concentrate even more the specific visual motifs that knit individual images into a single coherence. With the book as the goal rather than the single print framed and hanging on a wall the aesthetic imperative has clearly shifted. In the Tokyo edition of The Lines of My Hand (1972) Frank moves toward photographs that have no discernible subject but consist entirely of apparent contingencies. He also abandons the interlinking iconography that makes the sequencing of The Americans so powerful. In The Lines of My Hand, besides reprinting some of the photos from The Americans and even earlier work in London and Paris, Frank includes a variety of presentations, including photomontages, photograph of groups of photographs pinned to walls (90), and strips of 35mm exposure either as contact sheets (foldout 84-87) or more deliberate constructions. The three frames presented as US. Post Office, PAINT ROCK ALABAMA construct a nearly complete survey of the post office unfolded in a cubist manner, with the central frame featuring the boxes and a recruiting sign reading “BE A VOLUNTEER” (81-82). The other two frames look deeper, though, and present the shabbiness of the interior in a way that deconstructs the more official-looking central motif. This is a step toward eliminating the center of interest by implicitly critiquing it: the center, with its PO boxes and recruiting posters, is a bit of a sham. The post office is this plus the shabby peeling walls, sad century plant, and blank windows opening into unknown space. Linking three 35mm frames violates the integrity, such as it is, of the central photo, and challenges the notion of the photograph as a selective aesthetic act. But Frank goes much further. Immediately following the post office photos, the four-page foldout of 35 mm contact sheets invokes cinema with its many frames; yet instead of unfolding an action or narrative it reveals three or four versions of each of many photographs from The Americans. This presentation critiques that earlier book’s coherence, exposing the uncertainty and missteps in creating what in 1958 seemed a stable and highly selective aesthetic unity. Also in 1958 Frank produced “The Ten Bus Photographs,” which he claimed “represent my last project in photography” (Lines 100). More than most of the work in The Americans, this series of street photographs embodies elements of chance, both formally and in subject, almost to the point of seeming random, as if no human intelligence had framed, focused or otherwise composed them. Possibly Frank thought he had gone as far as he could in embracing aleatory imagery. But these photos still have centers of interest—one or more human figures, a truck, a hand dangling from a car window. We can still say that these are intentional (if just barely) photographs of things we can readily identify. On pages 111-112 of The Lines of My Hand a large and unfortunately guttered photo depicts a bulletin board with various photos tacked to it. All or most seem to be of the Mabou (Cape Breton) area where Frank lives part of the year. Also tacked to the board are notes and advertisements, including one for Eugene Smith’s work. Three photos placed together depict a panorama of a bleak, treeless scene. The photos don’t quite mate; one is misaligned so the horizon is too high to meet that of the other two. A text placed at the bottom of this photo and overlaying it reproduces a typed letter to Kazuhiko Motomura, the publisher of this edition (he also appears in a note on page 1). It refers to this photograph as “the final picture in the book” (which it is). This self-reflexivity is a characteristic part of the postmodern project. It calls our attention to the fact that the construction of a book like this is itself largely contingent on factors other than aesthetic considerations, that a book is actually an intervention in, critique of, or sometimes a negation of the purely aesthetic process. In a comparable gesture, Ashbery’s aggressive wielding of aleatory figures calls attention to the arbitrary (and self-conscious) construction of his poetry, although unlike the photographer the poet has absolute control over the choice and placement of elements in his work. Frank’s later work abandons all of the conventions of fine-arts photography and moves decisively toward a decentered aesthetic of entirely contingent elements. Mailbox + Letters, Winter, 1977 is a collage of ten snapshot-sized photographs superimposed on eight typed business letters from galleries, dealers, and others (Greenough 322). The photographs seem to critique the business letters by imposing on them a barren rural scene featuring the mailbox in which these letters apparently arrived. In one photo at the top a figure approaches, kicking up snow as he walks. In the next-to last photo at the bottom of the collage a human figure in profile, capped with a plain wool hat, looks down toward a flat seascape. The last photo, one of five featuring the mailbox, shows that mailbox also gazing out to sea. The two human figures compete with the mailbox for the reader’s attention, but no photo includes both a person and the mailbox. The effect is to render both mailbox and human as beside the point: the barren landscape dominates, and even the sea lacks sufficient drama to engross the viewer. The collage teases the viewer with the suggestion that imposing photos on letters means something, but the letters are not fully readable, the photos are indeterminate, and the overall effect is to project an emotion that like that of an Ashbery poem is easier to feel than to name. Most recently Frank has published a series of small books—artist’s books, we might call them—with the German publisher Steidl. These collections include portraits, landscapes, and difficult-to-classify photographs, some Polaroids, others 35mm prints. In Park / Sleep (2013) Frank includes one of his characteristically oracular observations: “I suppose my photographs are of things I don’t want to forget / My instinct tells me that they are important / They are quiet / They demand no attention / They are not empty.” The things he doesn’t want to forget, however, are not necessarily objects or people singled out for attention. They seem rather to be arrangements, in which placement, framing, and selection lend importance to a relationship created by the photograph. In some instances it is difficult to detect any particular subject. The photograph immediately opposite the page with Frank’s observation is entitled “Park and Sleep” and shows a patch of grassy but unkempt ground with bushes in the background, no horizon, and two trees partly shown, one leaning out of the left side of the photo, the other thrust into the upper right corner. A house looms faintly through the bushes in the background, but it is too indeterminate in form or bulk to occupy our attention. By most standards this is a photograph of nothing in particular, yet the title suggests not only a place but a human process—a dream landscape, possibly? But if so it is a remarkably dull dream. The photo directly above Frank’s remarks is taken from inside a car and shows the driver’s side rearview mirror, a tangle of branches, and a dark landscape with a glimpse of white sky in the upper right corner. The bit of landscape—the contingent image-- caught in the rearview mirror is brighter than the bulk of landscape in the immediate background. Many of the photographs in this and the other Steidl books seem intended to illustrate not merely the occurrence but the prevalence of aleatory details. In Partida (2014) appears an uncaptioned photograph showing the upper half of what seems to be a framed portrait obscured by corruption of various kinds on the glass or on the photograph. Largely obscuring it, however, are two smaller framed photographs—one showing two seated police officers, the other showing a soldier in tropical uniform (shorts, short-sleeved shirt) and a man in civilian clothes, both standing. We may conjecture some relationship among these five depicted (or very faintly depicted, in the case of the larger photograph) figures, but Frank’s camera has cut off the bottoms of the smaller framed photos and at least half of the larger one. The eye drifts to the loop of hanger at the top of the large photograph. Frank’s composition (or lack of composition, some might say) seems to emphasize the arbitrary, contingent, or tentative relationship among framed images, a critique of photography itself. The bland incompletion of this image challenges the notion of the well-made photograph, the art photograph, and even the idea of photography as a form of memory, because nothing could be less memorable than these anonymous and partly obscured figures in their cheap wooden frames. Without a center of interest, without apparent formal intentions, this photograph seems shaped by nothing more than chance, as though Frank had pointed his camera at random. Although we may assume that Frank photographs intentionally, the refusal of the resultant image to yield that intention challenges the usual notions of art as a formal construction or photography as documentary or utilitarian. Why has photography, whether as art or as tool, become so ubiquitous? Possibly because it is such a useful way of dealing with (selecting from, sorting, arranging, classifying, recognizing, acknowledging) a world of things. Or daily lives are largely the story of our encounters with objects. Sontag in her journals cites Kafka: “One photographs things in order to get them out of one’s mind” (377). But that’s only one of many possible reasons. The opposite may also be true. One might photograph things to gain some grip on them, stake a claim on their otherness. This may be the case with Frank’s more recent photographs. Frank’s subject, then, is the connection among objects, foregrounds, and backgrounds. The immediate illustration, on the page facing this little poem, is simply entitled “Mabou”. It is a vertically oriented photograph showing mostly a plain wall with an oval framed cluster of quills, and at the bottom, a table top with a curtain partly slumped on one end and a small mat and sheet of paper. This mysterious arrangement of gray tones may seem to invite a reading (why the framed quills? ), but more cogently it challenges us to appreciate an arrangement that is so minimal it seems no arrangement at all. No background, almost no foreground, the oval frame of quills too small in proportion to the expanse of wall. A photograph like this goes far beyond Friedlander’s experiments in urban clutter. Those photographs challenge us to trace the visual relationships in a scene offering many possible centers of interest, and to recognize the actuality of visual complexity as an aesthetic experience. Frank offers minimal material and no formal considerations, so in order to enter this image we have to shed all preconceptions not only about photography but about art itself. The idea of an art based on connections among things that neither have inherent connection nor formal connections imposed by aesthetic gestures on the part of the artist is conceptually difficult to process. Perceiving the structure of such art requires even more than the usual participation by viewer / reader. But nearly absolute contingency is not a new idea; it is the result of a development that begins in the Romantic era. Baudelaire in the mid-nineteenth century pointed the way when he noted the “transitory, the fugitive, the contingent” atmosphere of modern urban life (43-44). But in translating perceptions from life to art Ashbery and Frank go much further than Baudelaire did, or, for that matter, Eliot and Pound. Rather than shoring fragments against ruins, they embrace the fragments. No longer does the artist require the artwork—poem or photograph—to model a unity or wholeness difficult to detect in the actual world. No more Cantos or Notes toward a Supreme Fiction. As Sontag observes, “The modern way of seeing is to see in fragments. It is felt that reality is essentially unlimited, and knowledge is open-ended. It follows that all boundaries, all unifying ideas have to be misleading, demagogic; at best, provisional; almost always, in the long run, untrue” (“Summa” 124). So Ashbery and Frank, embracing modern or postmodern poetic or photographic seeing, dispense with formalist, unifying elements, whether structural ideas or compositional elements. Yet the aesthetics Frank and Ashbery have established brim with rich complexities. The disconcerting ease of Frank’s seemingly un-composed photographs and Ashbery’s apparently random imagery brings the willing viewer or reader into fresh relationships with the perceptible and imaginable world. William Doreski has published several books of criticism, including The Modern Voice in American Poetry and Robert Lowell’s Shifting Colors. His essays and reviews (as well as poetry and fiction) have appeared in many journals. He lives in Peterborough, New Hampshire, and is Professor Emeritus at Keene State College. Ashbery, John. Some Trees. New Haven: Yale UP, 1958; rpt. NY: Corinth Books, 1970. ---. Quick Question. NY: Ecco, 2012. ---. “Be Careful What You Wish For.” New York Review of Books 62.4 (March 5, 2015): 28. Arbor: University of Michigan Press, 2004: 117-119. Century. NY: Cambridge University Press, 2005.
and Francis E. Hyslop Jr. University Park: Pennsylvania State University Press, 1964. Collingwood, R.G. The Principles of Art. NY: Oxford, 1938. Evans, Walker. “The Reappearance of Photography,” Hound and Horn 5.1 (1931). Frank, Robert. The Americans. NY: Grove Press, 1958. Rpt. Göttingen: Steidl, 2008. N.P. ---. The Lines of My Hand. Tokyo: Yugensha, 1972. ---. London/ Wales. Ed. Philip Brookman. Washington: Corcoran Gallery of Art, 2003. ---. Park/ Sleep. Göttingen: Steidl, 2013. ---. Partida. Göttingen: Steidl, 2014. N.P. Galassi, Peter. “Introduction.” Robert Frank in America. Göttingen: Steidl, 2014. Evans. Ed. Lincoln Kirstein. NY: Museum of Modern Art, 1938.
on the Aesthetic of Photography. Boston: Godine, 1980. Allen and Warren Tallman. NY: Evergreen, 1973: 147-161. Rimbaud, Arthur. The Letters of Arthur Rimbaud: I Promise to be Good. Trans. Wyatt Mason. Schwabsky, Barry. “Higher Beings Commanded,” The Nation 298: 20 (May 19, 2014): 40. Sontag, Susan. On Photography. NY: Farrar, Straus, 1977. Rieff. NY: Farrar, Straus, 2012. ---. “Photography: a Little Summa.” At the Same Time. NY: Hamish Hamilton, 2007: 124-127. Stewart, Susan. On Longing. Durham: Duke UP, 1992. Thompson, Jerry L. Why Photography Matters. Cambridge: MIT UP 2013. Vendler, Helen. Invisible Listeners: Lyric Intimacy in Herbert, Whitman, and Ashbery. Princeton: Princeton University Press, 2005.